Hypnotising. Intriguing. Poetic. Enchanting. Enthralling. Compelling. These are the words I’d use to describe Shatter Me. I came into Shatter Me with high expectations. I’d heard awesome things about it, and frankly, it sounded really awesome. I wasn’t disappointed. Shatter Me is about a girl called Juliette who has been locked in a mental institution for nearly a year due to her morbid ability to be lethal to anyone she touches. I should probably warn you that there’s romance twisted into it as well. 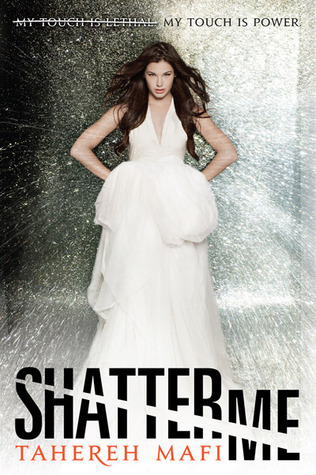 What can I say about Shatter Me? The writing is probably one of the most memorable and lyrical I have read this year. While it sometimes seems Mafi gets dragged away with metaphors and imagery, there is something chilling in the way it’s written. It really gets inside your head. The plot itself is fast paced, and thrilling. It never bores you. Something is always there to tamper with your emotions and keep you reading to the next chapter. All the characters speak clearly in this novel. As I said before, Juliette’s voice really gets to you. It’s completely poignant and relatable. I just got her straight away. Adam is possible one of the greatest love interests of all time, as is Warner who is easily one of the most awesome psychotic villains out there. I can’t wait to learn more about him and Kenji in the next books. You cannot leave the story of Shatter Me without it affecting you, and is easily one of the highlights of this year’s debut novels. Chilling, electrifying, and incredibly unforgettable, it’ll leave you gasping for more.